Here at number 7 is the only front garden you will find in Fournier St. 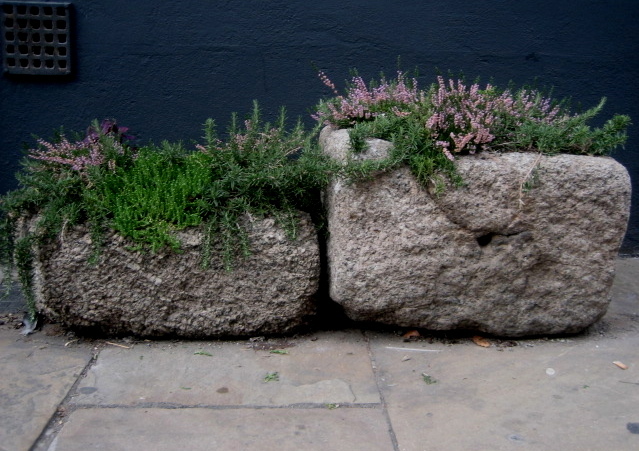 Planted in two old rough-hewn granite troughs on the pavement, this is one of my favourite London gardens. Close by Commercial St and on the north side of Christ Church, Spitalfields, it is a tiny patch of plant life in an unlikely location. Forgoing the brightly coloured flowers, replaced seasonally and favoured by many urban gardeners, this is an austere but realistic choice of plants for such an exposed site. The Stonecrop, Ling and Rosemary growing here are hardy species, native to dry rocky uplands, that can thrive in an urban environment such as this, unaffected by the dirt and dust. Every time I walk past, my eye is always drawn to this unique and lyrical piece of cultivation. However preoccupied I may be, I am momentarily released in my imagination to the mountains and moors far beyond the powerfully immersive experience of living here in this great city. Thank you! What a lovely description of my wee garden! I pass this every day on my way to work. It always makes me smile.